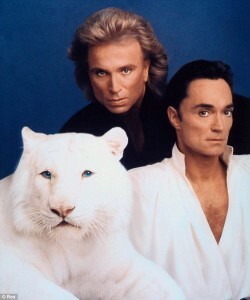 Possibly one of the greatest magic/illusion shows in the entire history of magic was that of Siegfried and Roy who captured the imagination of more than twenty five million people during their incredible career. Siegfried Fishbacher was brought up in Rosenheim Germany while Roy Horn came from Nordeheim. During his youth Siegfried found a 5 Mark bill in his street and bought a magic book that he studied earnestly. Roy Horn spent a lot of his youth at the Bremen Zoo because he was attracted to exotic animals and ended up looking after a 2 year old Cheetah called Chico. Siegfried managed to land a job at the Lago di Garda Resort in 1956 where he began to do small magic shows. Siegfried and Roy met in 1957 while Roy was a waiter and Siegfried was a steward aboard the cruise liner TS Bremen. Roy watched Siegfried perform and they soon established a firm friendship. Siegfried was producing a rabbit from a hat that prompted Roy to smuggle the cheetah Chico aboard the ship and so began their unique, highly successful partnership in magic. After performing at sea for 5 years they returned to tour Germany, Switzerland and Monte Carlo, then in 1967 made their debut in Las Vegas at the Tropicana. Here they introduced a white Bengal tiger into the act called Sahra. During the next decade they performed in Puerto Rico and Las Vegas where they became big name entertainers in the mid 1970’s. With their love of big cats, the Maharajah of Baroda asked them to help save the rare, endangered white tigers and were given 3 cubs that successfully produced offspring under their care. The type of magic and illusion that Siegfried and Roy performed in Las Vegas was fairly standard but with the introduction of the big cats gave the show a whole new image that drew huge crowds to their performances that over the years became even more spectacular. One particular illusion called the Squeeze Box where an able assistant enters a long box with her head and legs showing. The box is then squeezed from both ends, so she is condensed to about 12 inches tall. The box is then lengthened again and out the lady pops, normal height again and none the worse for her ordeal. Another illusion that stands out was where a gorgeous girl assistant was placed inside a steel cage then a large cloth was then thrown over the cage. The cloth was immediately removed to show the disappearance of the girl and in her place was a beautiful black leopard inside the cage. Roy then walked the leopard around the edge of the stage, so close to the audience one could almost reach out and touch this beautiful creature. Siegfried and Roys costumes and stage settings became bold and colourful with the gradual inclusion of classier magic tricks and illusions using a white lion and white tigers. Roy in particular seemed to develop a close relationship with the big exotic cats in the show that were always paraded boldly on and around the stage. It became the most successful and longest running show in Las Vegas, while Siegfried and Roy commanded huge salaries and were the highest paid performers of the time in Las Vegas. They were instrumental in making Las Vegas the Magic Capital of the World. 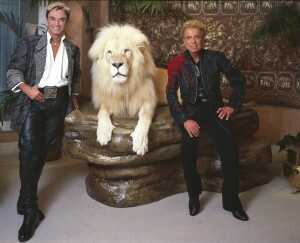 During Siegfried and Roy’s career spent mostly at the Hotel Casino “Mirage”, The two illusionist had built a large “Secret Garden Menagerie” that was home to their white tigers, cheetahs, dolphins, flamingos, lions and Gildah their elephant. It was at the Secret Garden where a number of rare creatures were born and raised. They became acknowledged for their participation and involvement in wildlife conservation. Then in October 2003 disaster struck during a stage performance. Roy was attacked by one of the white tigers called Montacore and savagely mauled in the neck and throat and suffered a stroke at the time. He underwent surgery that resulted in a long period of recuperation and healing. Roy made fairly good progress and was eventually able to make a final stage appearance with Siegfried in Februaryw 2009 at the Bellagio Casino Complex. But the curtain as about to come down of the Siegfried and Roy Magic /Illusion Show that brought joy and spectacle to millions. On April 23rd 2010, the Casino was forced to close the show with 267 cast and crew being laid off. It was the sad end to a great magical era. Nearly everyone that visited Las Vegas made seeing their show an absolute must and they will long be remembered as wonderful performers who brought wonder to their audiences. In 2000 they were accorded the ultimate accolade as “Magicians of the Century”. A lesson for magicians who use live animals in their acts is to always be aware that the wild instinct is ever present in jungle creatures, despite the care and attention these beautiful creatures justly deserve and receive. A review noted at the time stated, “While they gave audiences great pleasure on stage they have given back magnificent animals to the world. Bringing the White Tiger and White Lion back from near extinction and into the new century is a huge magical accomplishment. It’s amazing that such a feat would emanate from Las Vegas. It shows the perseverance of these two very special human beings”. After the retirement of Siegfried and Roy from show business Siegfried and Roy, so often referred to as, “The Masters of Illusion”, became benefactors and philanthropists of renown. They founded the ‘SARMOTI- FOUNDATION’ for the benefit of endangered wild life species that is well supported and endorsed around the world. They support a number of local charities that include the Las Vegas Police K-9 unit, and a number of youth organisations. 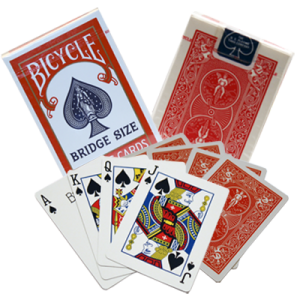 Some of the overseas organisations that have received financial support are young people’s clubs and The College of Magic in Cape Town South Africa. The College now offers magic bursaries and the opportunity for disadvantaged African children to learn and study magic. The recent approval of the SARMOTI grant to the College enabled a group of youngsters to travel to Las Vegas to meet with their benefactors. Hopefully some of these young aspiring children will make it to the top as magical African entertainers. Siegfried and Roy will be long remembered as two of the most spectacular performers of all time who changed the face of magic by their introduction of exotic wild animals into their shows. They have thrilled millions with the danger and mystification of their magic and already have become an integral part of our magical heritage. We can be so grateful that through the wonderful magicians we have had over the centuries in the history of magic, no performers in any field of entertainment have advanced the art of theatre and stage performance as much as our pioneer, early magicians and of course Siegfried and Roy. So you are in good company.